WW1 Reenactments Equipment : Great War Tommy WW1 Documents, Paperwork : Headed notepaper, 1914-1915. WW1 Reproductions and WW1 Reenactors Equipment / Kit - Headed notepaper, 1914-1915. 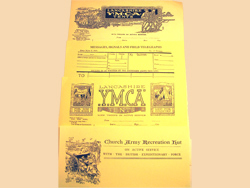 Selection of 4 different headed sheets showing headings for different support organisations, YMCA Tents, Church Army Recreation Huts, etc, 8 sheets in total.